Wherever the Chinese dwell, Chinese food vendors sell. The same thing goes to where I live. Being a Chinese descent, I grew up eating Chinese foods. Not only am I able to eat home-cooked Chinese meals at my own dining table, I am also able to try a variety of Chinese dishes outside home; thanks to the many different food establishments found in the country. I do like trying out different dishes other than from my own heritage, but Chinese foods will always have a special place in my heart. Eating Chinese dishes never fails to give me a sense of nostalgia, as I always associate these to Chinese banquets and family gatherings. The hearty meals are what keeps us remember our roots while holding the family together around the table. The way the dishes are served are banquet-style: dishes are placed in the lazy susan while each person take turns to help herself with the servings. When a person takes a serving and places it on other people's plate, it's a sign of affection. Here in this page, I have listed the common Chinese dishes you may find in a Chinese restaurant. Many of the dishes are best eaten with rice. I have also included some pictures so you'll have a general idea on what to order in a restaurant. Enjoy the pictures as you scroll down the page and I hope there's a nearby Chinese restaurant in your area where you can try these dishes. Mapo Tofu is a popular Szechuan (a province in China) dish made of tofu and minced meat cooked in a spicy bean-based sauce. The hot and spicy flavor of the dish makes it a great topping to rice. I could finish a bowl of white rice with only a few spoonfuls of mapo tofu. When you try this dish, make sure you have a glass of cold water beside you, because this dish can get very spicy. No, this isn't a pastry as the name suggests. It is rather a special kind of omelet with oysters as the main ingredient. Aside from the oysters, bean sprouts, onions and chives are added into the scrambled egg mixture with seasonings. The potato starch is also added for a sticky consistency. The result is a crispy crust with a chewy inside. I have never liked oysters before but surprisingly this dish is my all time favorite. 1. The crispy skin of the duck is wrapped around very thin Chinese-style pancakes with leeks or cucumber strips and sauce. 2. The meat is minced and may also be wrapped with a lettuce (depending on the restaurant). 3. The remaining bones and meat are made into broth. What makes this dish interesting is that it is usually prepared in front of you. You will see the servers carve the duck into different parts, producing the three ways of eating Peking Roast Duck. Combine food, culture, and romance, this is what you'll get. Be warned though, you might get hungry by merely reading the delectable descriptions of Chinese foods. 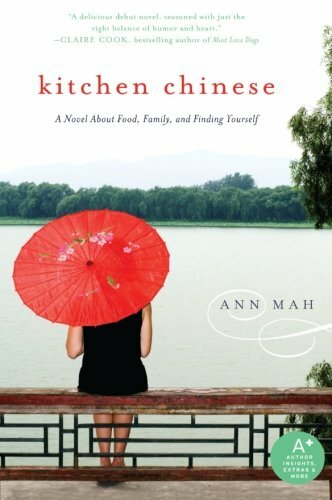 A truly light and fun read, the novel is the first book of Ann Mah, who is the Chinese-American daughter of author Adeline Yen Mah. The main ingredients of Yang Chow Fried Rice consists of rice, eggs, barbecued pork, spring onions, and shrimps. The shrimps and pork provide the sweet flavor to the dish. Cooked rice that is at least a day old is usually used for the fried rice to avoid a sticky outcome. The viscous sauce of this dish is a mixture of sugar, ketchup, soy sauce and vinegar. The powerful taste of the sauce over the deep fried pork makes it a good accompaniment to white rice. Pineapples, green peppers, and onions are also added to the dish. Literally means "fork burned," this dish is skewered pork cooked over fire. Char Shiu is made from varying cuts of pork and is reddish outside then thinly sliced. Glazed with hoisin sauce, oyster sauce, honey, and 5 spice powder, Char Shiu is very flavorful and chewy outside, while the inside moist and tasty as well. It may be eaten over rice or noodles, or eaten as fillings of buns. Often served first before any other dishes in Chinese restaurants, the assorted cold cuts are a combination of different pre-cooked and cured meats. The usual cold cuts in this combination are roast duck, pork belly, soy chicken, char shiu, and chinese sausages. These are often arranged beautifully into groups and accompanied with jelly fish and century eggs. Kung Pao Chicken is a Szechuan dish. It's name was derived by a Szechuan governor. The dish is deeped fried or stir fried diced chicken mixed with chili peppers, vegetables, and peanuts. The chickens may be already marinated before being fried with other ingredients. Spring rolls are ground meat or vegetables that are rolled inside wrappers, forming a cylindrical shape. The fillings vary from ground pork to mixture of vegetables such carrots, bean sprouts, and tofu. The rolls may be fried or steamed. Credit: avlxyz via FlickrTranslated into Stir Fried Noodles, the Chow Mien is basically noodles mixed with a variety of ingredients such as pork, beef, shrimp, and vegetables. The noodles are first boiled and then transferred to a wok to be stir fried with other ingredients. Congee is another popular Chinese dish suitable to be eaten during the cold winter days. It is mainly consisted of rice and stock. There are several variations of congee, ranging from fish, pork, beef, and chicken that can be added into the porridge. Many restaurants in China offer congee as their main specialty, with many additional ingredients to choose from. This article made me hungry! I love most of the dishes listed here. I got hungry too while writing this article. LOL. Nice overview. I haven't tried a lot of these dishes, and probably never will, since hubby and I are gluten free now, but Oriental food is one of my favorite cuisines. Luckily, I've learned how to cook several dishes myself at home. Thank you, LavenderRose. Too bad you wouldn't be able to try the rest of the dishes here. They are delicious. I am still in the process of learning how to cook these dishes - I'm not a great cook in the first place. Ingredients were easier to get when we lived in California. Here in Utah, there's only a few things in the grocery stores. Haven't seen an oriental grocery here yet. Maybe further north of us. Too bad you don't have so many things in the grocery stores there. Here in where I live, it depends on the store. Some stores do sell ingredients specifically for Chinese cooking. Many supermarkets also have aisles dedicated to oriental cooking, but are only limited to condiments. I have heard of some of these but not all. Here at the Pacific coast we have a large Chinese population so we have a lot of Chinese restaraunts and markets. The food is delicious. I wonder how the Chinese dishes taste like in the Pacific coast. I hope you can try out the other dishes as well. This is an excellent invitation to favorite Chinese dishes for those who may not already know what to order in an authentic Chinese restaurant. I've tried some of these and can highly recommend them, especially Mapo Tofu, Char Siu buns, Peking Duck and Congee! Thank you. You seem to really know a lot about Chinese cuisine. They're indeed very delicious! Mapo Tofu - I've never seen this one, but I'd really love to try it! These all look great, a few I have had :). I always thought that tofu is too bland. However, this particular dish is very tasty! I hope you can try it soon.